Remember The (fill in the blank)! This has been a battle cry in this country since the Battle of the Alamo in 1836. This cry has rallied troops and civilians alike. In the cases of the USS Maine and the USS Pueblo, the cry was also printed on bumper stickers and banners. 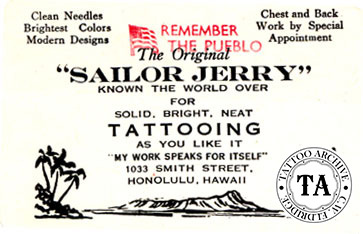 Sailor Jerry actually rubber stamped "Remember The Pueblo" on his business cards. 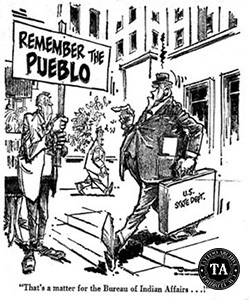 The political cartoon below pokes fun at the Pueblo incident. Remember The Alamo? This fierce battle for Texas independence took place in 1836. Davy Crockett, Jim Bowie, William Travis and a ragtag group of men battled the Mexican General Santa Ana to their death. The battle raged for 13 days, with the Mexican General overrunning the old mission in San Antonio and killing everyone inside. This was the first major battle for Texas independence, but not the last. Only 46 days later, General Santa Ana clashed with General Sam Houston at the Battle of Jacinto. Sam Houston was the victor, winning independence from Mexico for the Lone Star State. 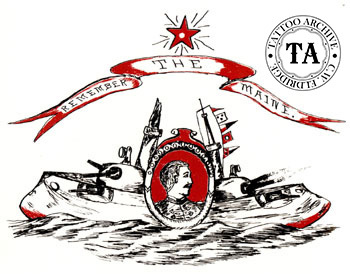 Remember The Maine? The year was 1898 and the battleship USS Maine was sent to Cuba to protect American interests while Cuba struggled with Spain for independence. While anchored in Havana's harbor, the Maine blew-up killing hundreds of sailors and damaging America's military pride. Within a couple of months, the Spanish-American War was in full swing and by summer's end, Spain had conceded Cuba, the Philippines, Puerto Rico and Guam to American forces. In 1912 what was left of the Maine was towed out to sea and sunk in the deep water of the Gulf of Mexico. The William Hearst newspapers claimed that the Spanish were to blame and after an investigation the US government agreed. Interestingly, no one was ever tried for the bombing. Years later, in 1976, US Navy Admiral Hyman Rickover was assigned to re-open the investigation about the explosion on the USS Maine. His team of experts concluded that the explosion occurred in a coal bunker on board the ship. In other words, the Spanish had nothing to do with it! Remember The Pueblo? The USS Pueblo was a U. S. Navy vessel sent o an intelligence mission off the coast of North Korea. On January 23, 1968, North Korean naval vessels and MiG jets attacked the Pueblo. The North Koreans contended that the ship had violated their territorial waters, a claim vigorously denied by the United States. They charged the remaining 82 American crewmen with spying, and detained them under inhumane conditions for eleven months, until Washington finally issued a formal apology. The captain and crew were released 2 days before Christmas. Many in this country and around the world felt that the US government dragged their feet in securing the release of these sailors. Many returned home crippled or nearly blind from malnourishment. The ship was left behind in North Korea where it became a tourist attraction. 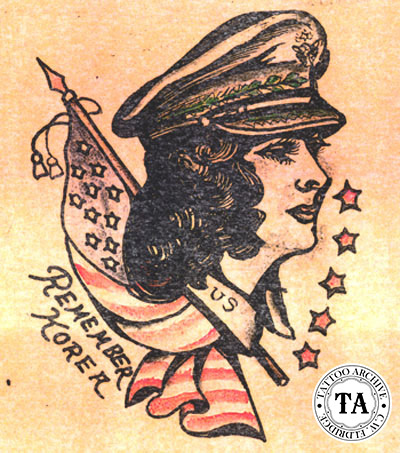 As the Korean War raged, images captioned "Remember Korea" began to appear in tattoo shops. Sailor Jerry, a staunch anti-communist, must have been beside himself with the news of the USS Pueblo's capture! There were many articles in newspapers around the country berating the US government for their lack of action against the North Koreans. Jerry, God bless him, decided to make a statement about this injustice. He went out and had a rubber stamp made with an American flag and the battle cry, "Remember The Pueblo." He then stamped this on his business cards, using red ink. Jerry's political statement was not a first in the tattoo world. 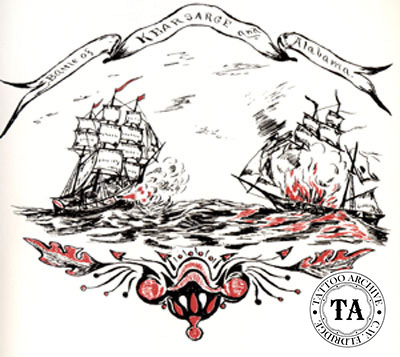 Beginning in the 1800s, tattooists would reflect the political climate by the designs displayed on their shop walls. 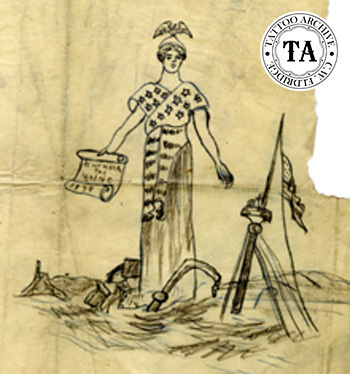 C. H. Fellowes an east coast tattooist, includes designs in his collection which not only memorialized the USS Maine, but also the Revolutionary War battle at Bunker Hill in 1775 and the sea battle between the C.S.S. Alabama and the U.S.S. Kearsarge 1864.